When we go out to eat, sometimes I order an appetizer as my main meal. They are usually the perfect portion size. Occasionally, we will order an appetizer to share and an entree, if we can agree on the same thing:) We also like to make appetizers at home for parties, snacks, and even meals. A few of my favorites are hummus, vegetable spring rolls, and baked zucchini fries. Josh loves to make buffalo hot wings and chicken smothered nachos. 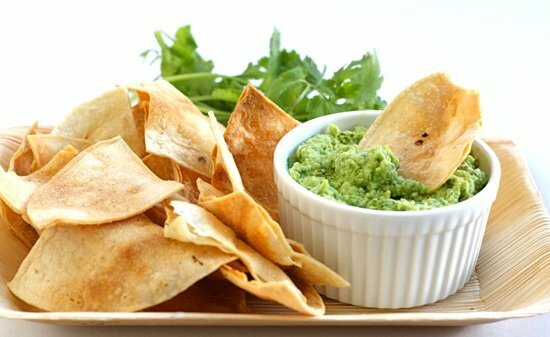 Two appetizers we always agree on are edamame and guacamole. Since we love them both, I decided to make edamame guacamole. Two winning appetizers in one. Josh grew up in California and lived in Santa Cruz after he graduated from the University of Utah. He was working and enjoying his bachelor years along the California coast. Sure, he loved the beach and warm weather, but he really loved California’s fresh produce, especially the avocados. California is the leading producer of domestic avocados and home to about 90 percent of the nation’s crop. Josh made sure he ate his fair share while he was living there. One day he over did it though. He was craving guacamole and decided to whip up a batch at home. Avocados were on sale, so he went all out and purchased ten. He wasn’t going to use all ten for his batch of guacamole, but after he got mashing, he couldn’t stop. He used all ten avocados and made a monstrous bowl of guacamole. He sat down with his chips and started to dip. The guacamole was so good, he couldn’t stop eating it. (Josh has no self control when it comes to guacamole and donuts). He ended up eating the entire bowl of guacamole. All of it! Ten avocados in one sitting, not a good idea. He was very sick that night, but if you ask him if he would do it again, he would smile and answer-YES! Josh was a little hesitant to try this guacamole-he thought the edamame would ruin one of his favorite dips, but he was pleasantly surprised. The edamame mixes in well with the avocado, keeping the bright green color. The guacamole is creamy, buttery, and delicious. Plus, it is good for you! This guacamole is full of protein, heart healthy fat, and fiber. We made homemade baked tortilla chips to scoop up our guacamole. It is also a great dip for cut up vegetables and I even like it as a sandwich spread. 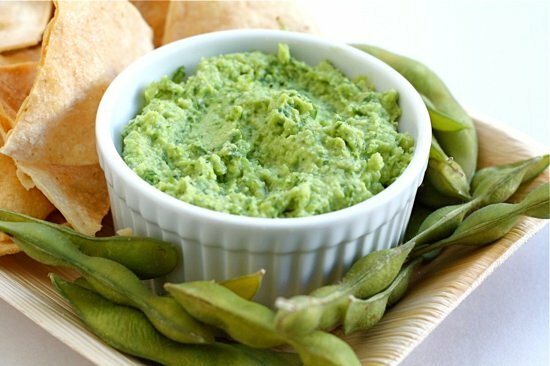 Edamame guacamole is one of our new favorite appetizers. Josh was tempted to eat the whole bowl, but luckily I was there to stop him. 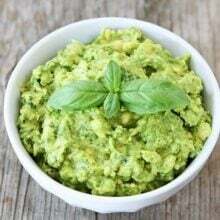 Put edamame, avocado, cilantro, garlic, onion, jalapeno, and lime juice in the bowl of a food processor and pulse until combined. Add enough water to make a creamy consistency and pulse again. Pulse until smooth. Transfer edamame guacamole to a serving bowl and season with salt and pepper. Stir. Serve with chips or vegetables. *Note-this guacamole is also good as a spread on sandwiches. I just recently caught on to ordering appetizers for my meal! They are the perfect portion! This sounds awesome! Combining two of my loves! Maria, I love avocado, and I love edamame, so why not put them together? I recently made a pea and edamame pesto that was a big hit! Two of my favorites! Though I don’t think I could eat a bowl as big as the one Josh made…hehe. LOVE edamame guac! It is so good, and would you believe that it was the first way I had edamame? Just love it! A great healthy idea! That is a lovely guacamole! 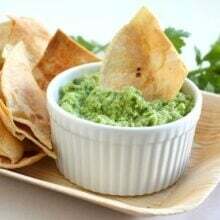 I’ve made a similar dip (I think my hubby named it “guacamame”) and it’s one of my favorites. I’ll have to whip up another batch this week! I have edamame and 4 avocados, and this looks awesome! I love appetizers. My husband and I always want to try a bunch of things so we often get 2-3 apps instead of entrees. 10 avocados in one sitting!?! Makes me sick just thinking about it! But they are good, especially in Cali. I’ve never tried edamame…might have to ease into it with this version! What a great idea! 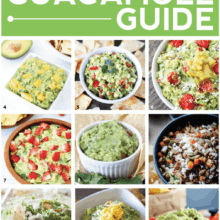 Guacamole is a favorite in my house and I am always looking for fun new recipes using avocados. I love how you combined two of my favorites: Edamame and Guacamole. What a tasty dip! Looks so good Maria! Need a big bowl for lunch! This sounds so yummy and perfect for Summer! I love the idea! How did you make the baked tortilla chips? Haha, poor Josh. 😉 This looks lovely though! Do you have the recipe for those tortilla chips on your blog too? Ten avocadoes! One sitting! That’s craziness! He must have been stuffed for DAYS. This edamame guac sounds delicious! Way to get in some protein in fiber. Josh was very sick after eating that big bowl. His appetite amazes me sometimes! Everyone is interested in the homemade tortilla chips, sorry I didn’t post the recipe. I will post it on Friday! So stay tuned friends! I LOVE this creation!! !what a great way to boost protein and fiber in this already great dip! so pretty! I have heard of this but still never tried it before, clearly I should make it myself. The green in your pictures is so vibrant! Ten whole avocadoes? Wow. I can only make guacamole a little at a time, because I’m the same way…I just can’t stop. I’ll have to try out this version. Looks yummy! excellent idea! what a great way to cut the fat. i’m the same way with appetizers. i always get the lettuce wraps at cheesecake factory even though it’s an appetizer. I also order appetizers at restaurants–sometimes two, so they you get to try more things on the menu! Yes, avocados are one of the reasons I might consider staying in California permanently. Definitely will be trying this! I love the sound of this, but now you have to tell me where you’re finding the shelled edamame in Utah; I’ve never seen that anywhere. Kalyn-you can find it at the Asian Market on 422 E 900 S in SLC. It is in the freezer section. They have shelled and in the pod edamame. It is cheap too. That’s a great idea, Maria. Keeping the lovely green and adding fiber and protein to an already delicious dish is genius. I could probably eat several bowls of that. i’ve seen this referred to as edamole, which i love. it’s a delightful creation–still the same color as and similar in flavor and texture to regular ol’ guac, but with such a nutritious punch! I love the edamame in this guacamole – great shot of healthy protein. I often order an appetizer and salad at restaurants, too. Not only is the portion size better, but I often prefer the appetizer choices. Yum. What a great idea! I love both things – brilliant to combine. No offense Josh – but I am kind of grossed out you ate 10 avocados in one sitting! Delicious, but oh so filling! This looks delicious! What a great idea. Can’t wait to try it. Love it and I can see this also as a great sandwich spread on burgers or bread and cheese sandwiches. You have a terrific website. I love the photography and this recipe sounds great. Once my avocados are ripen I will have to give this recipe a try. Yum! 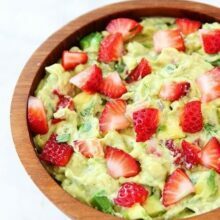 I have made an edamame dip but combining it with avocados and those other ingredients sounds even better! Hah I think we’ve all been there! Poor Josh! That variation sounds great! We are definitely going to try it! I didn’t think guacamole could get any better, but now know… add edamame!! Y.U.M. Ah. Two of my favorite things: edamame and avocado. That looks–and sounds–really good! What a great way to stretch the avocado! I know avocados are plenty nutritious, but the addition of all the protein and fiber in edamame makes it much more nutritionally balanced – love it! This looks and sounds wonderful!! I love both, great recipe!! yup. great recipe, but even greater story. that’s amazing. What a great and creative way to use edamama! Looks and sounds delicious! Your blog is lovely and this looks delicious! 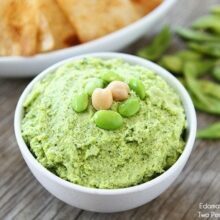 Thanks very much for mentioning my edamame dip, and I’m looking forward to exploring more of your recipes! How unusual! But this looks a FANTASTIC app. Can’t wait to try it. Yum! This looks delicious, putting the ingredients on my list for next week! We are big on ordering an appetizer then sharing an entree too. It always seems to work out perfectly with the huge portion sizes these days. This sounds wonderful! I’ve not come across this type of guac before. Yum! I love guac but adding the edamame sounds like a great way to make the texture more interesting. It also adds a good dose of protein to balance out all the (healthy) fats. Can’t wait to try this! Wow. Your food looks just amazing. We’d love to see your stuff posted at dishfolio.com! I made this over the weekend – Yummy, thanks! Yum! Delicious recipe. I love that you used edamame in this! The edamame blends in with the other flavors. It isn’t strong. California hass avocados are the best. The standards for oil content are adhered to the best in ca. Those coming from mexico or other countries are not held to the same strict standards. The very large avocados that you see from time to time in your market are very watery and do not have the same flavor, so don’t be fooled by thinking you will get twice as much for less money. Stick to the hass from ca and you will not go wrong. OMG … I love both edamame & avacado (and guacamole is one of my weaknesses) so *THIS* is something I am absolutely going to try!!! I’m so excited for this!!!! Sounds delicious. I’ve never made a dip with avocado and edamame before. I’ll have to try it soon. Just a quick question, do you think its possible to take out cilantro or will that affect the overall taste of the recipe?